How do I write down the moves? Write down the piece that moves, and then the name of the square it lands on. The columns (files) are lettered from left to right, a, b, c, d, e, f, g, h.
The rows (ranks) are numbered from 1 to 8, from the closest to White to the farthest away from White. So the White King starts the game on e1. The Black King starts the game on e8. The White Queen starts the game on d1. The Black Queen starts the game on d8. Always use capital letters for the piece abbreviations, and lower-case letters for the squares. Remember to write down the moves for both players. Usually scoresheets are provided, and they have a column for White's moves, and a column for Black's. If you castle on the King's side of the board ("castling short"), it's written O-O. If you castle on the Queen's side of the board ("castling long"), it's written O-O-O. If you capture a piece, you can use x to show it. Okay, here's a few game beginnings to help you get a feel for it. 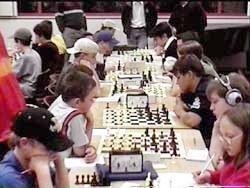 Review chess notation by watching a game unfold. Click on the buttons below the diagram to walk through the game. 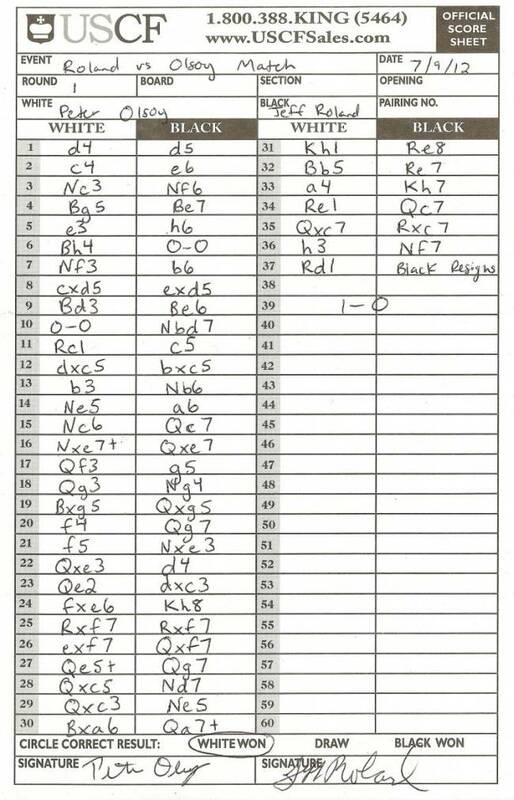 Here's a sample scoresheet, from a match between two of the best chessplayers in Idaho.